With the official launch of Westfield Tea Tree Plaza’s newly renovated food and entertainment precinct last week, comes TGI Fridays’ arrival to the north-eastern suburbs. Originally started as a brand in 1965 in New York City, TGI Fridays has now spread across the globe with over 870 locations. Already an established American-style restaurant in South Australia with their Westfield Marion location, TGI Fridays Chairman and CEO, James Sinclair, hopes the chain will continue to do well in Modbury. “Westfield did quite a lot of research in this area. We knew there was a really high demand for food and Fridays was actually the number one requested brand for this area,” says James. TGIF have decided, with Tea Tree Plaza’s incarnation, to invigorate the traditional American décor with a big island bar and large gantry, New York brick walls, and premium finishings, but the brand doesn’t skimp on their traditions. “Every Fridays in the world has a propeller in and around the bar and it reminds us that the bar is always the engine room of TGI Fridays. The business has always had a really strong bar-centric focus to drive it. So the cocktails and bar are a very important part of our brand and business,” James says. We decided to pay the new location a visit to see what all the fuss is about. We tried a selection of TGIF’s most popular items including their Jack Daniels glazed Signature Glaze Ribs, gigantic Bacon Cheeseburger, Asian-inspired 24-hour slow roasted Mandarin Style Chicken, and deliciously creamy Gouda Mac ‘N’ Cheese. With large portions the American way, TGI Fridays definitely encourages sharing. “People are wanting that taste of America back home. Buffalo wings have been in huge growth the last few years, big hearty American-style burgers have been really popular. But, as well as that, we’re blending in our new menu with some healthier items,” James says. 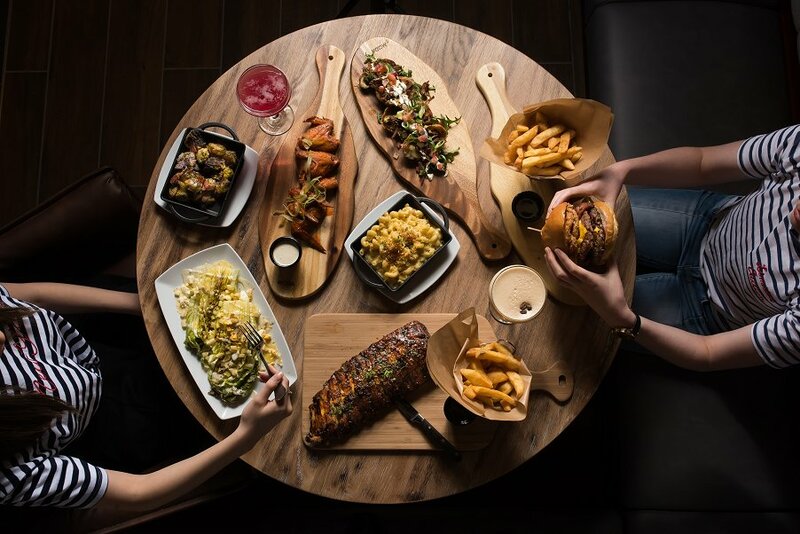 With casual style dining and cocktails, TGI Fridays is bringing Tea Tree Plaza the modern and contemporary edge it needs. “Our mission statement is to be Australia’s favourite casual restaurant and bar. We’re quintessentially American and I guess our purpose is to liberate Australians from their everyday with a bit of Fridays fun done the American way,” says James. TGI Fridays is located at Westfield Tea Tree Plaza, open every day from 11am til 10pm, and will be available on UberEATS soon.